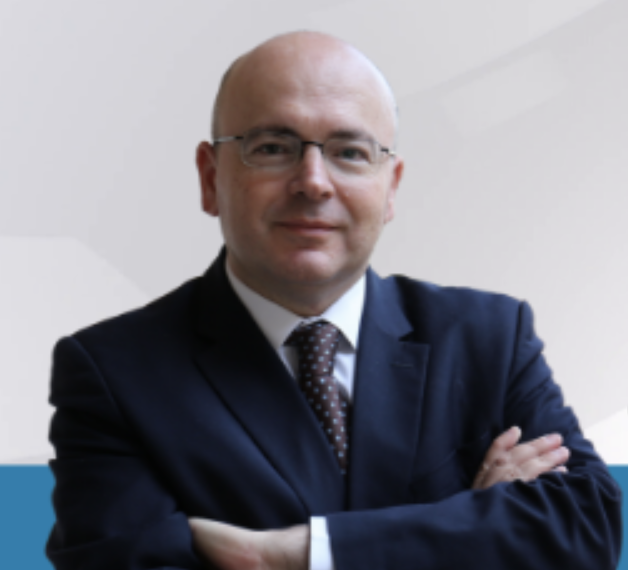 Mr. Robert Micallef from Malta is a candidate for the Labour Party in the European Parliament 2019 election and he pledges to support the establishment of the EP Volunteering and Solidarity Intergroup in the European Parliament if elected. Contact your EP candidates so that they can also pledge their support and contribute to better and more co-ordinated policies on solidarity and volunteering at the EU level! Find the pledges and pledge template here. 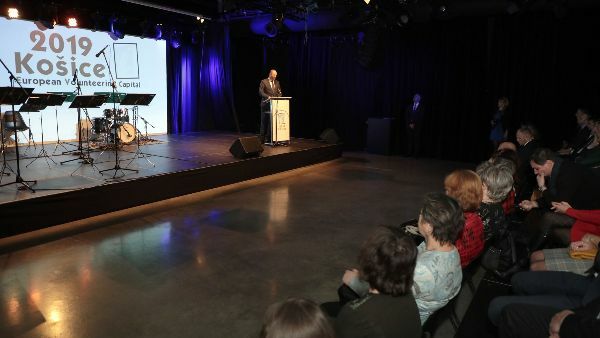 The opening ceremony for Košice, this year’s European Volunteering Capital took place on 15 January 2019. CEV Director Gabriella Civico participated in the ceremony together with the Košice Mayor Jaroslav Polaček, local & regional authorities and representatives from CEV members in Slovakia as well as former EVCapital candidates, pictures from the event here. Miloslav Klíma, member of Kosice 2019 #EVCapital, talks about the aims and benefits of hosting the European Volunteering Capital 2019 here. 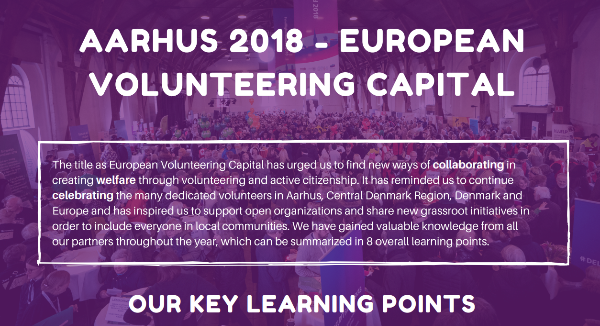 In 2018, Aarhus held the title European Volunteering Capital a framework in which the municipality explored new ways of collaborating in creating welfare through volunteering and active citizenship. It was an unique occasion to celebrate and recognize volunteers and increase the visibility of their contribution to community. An overview of the activities implemented as #EVCapital is available here as well as the 8 key learning points and recommendations following the year. In addition a video thanking volunteers for their commitment is published here. 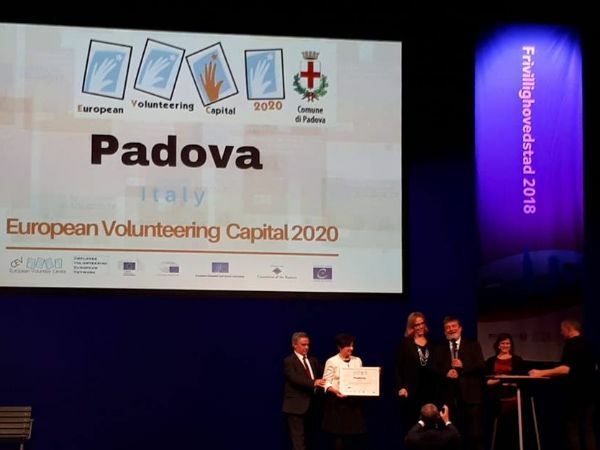 On 11 December 2018 Padova #EVCapital 2020 organised a conference to celebrate having won the competition and to ensure first preparatory steps for the year. Previous winners are Košice (2019) Aarhus (2018), Sligo (2017), London (2016), Lisbon (2015) and Barcelona (2014). Save the Date: A list of upcoming events comprising information on activities CEV is organising and/or will be part of in partnership with institutions & other organisations in 2019, is available here. On 22 - 23 January 2019, together with the European Youth Forum, the Lifelong Learning Platform and the European Commission (DG EMPL), CEV will organise a Peer Learning Activity on Validation of skills and competencies acquired through voluntary activities under the framework of the European Qualifications Framework Advisory Group. The event will be held in Brussels and will follow a kick off seminar for the Lever Up pilot Actions to take place in 2019 as part of the Erasmus Plus funded Lever Up project focussed on validation of soft and transversal competencies acquired through volunteering. Register here. CEV Director Gabriella Civico contributed an article on “Voluntourism” in the culture sector: Added value or valueless exploitation?” to the publication Voluntaris, Journal of volunteer services, Edition 02/2018. On 19 December, Giulia Bordin, CEV Project and Policy Officer, participated as a speaker at the event organised by the AGESCI Scout Group Mira 2, in Mira (Italy) “Discussing about Europe!”. With the participation also of Mr Paolo De Stefani and Mr Piero de Perini, professors at the University of Padova, the event has been a moment of fruitful discussion on the EU and on the importance of voting at the next EP elections, including CEV Vote Volunteer Vision Campaign. The Erasmus+ InScult final project meeting took place in Tallinn (Estonia) on 12-13 December 2018. 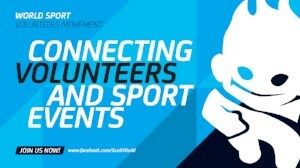 CEV team members Sara Fasoli and Andreea Nagy took part in the meeting looking into future possibilities of cooperation with the partners to ensure the continued exploitation of the project outcomes and enable even more volunteer actions in Sports. 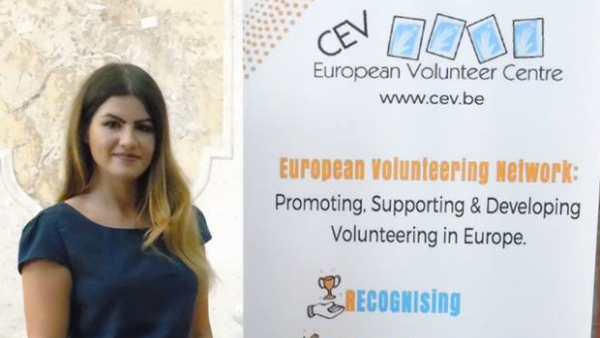 Wanda Alarcon Ferraguto joined CEV team as an ESC trainee for 2 months in 2018 and supported the advocacy and research efforts, particularly with writing the paper on “Voluntourism: a critical evaluation and recommendations for the future”. We are thankful for your contribution! Here are a few impressions about the time spent as a CEV team member. Juan Manuel Baez Ramirez has concluded hIs one year ESC traineeship in December 2018. He has been a fundamental member of CEV Secretariat staff and CEV is thankful for all the valuable work done and support offered to the team. The tasks he carried out at CEV include participation in project management (Tandem, WISH) website maintenance and drafting the CEV News in cooperation with the other team members. Here are a few impressions about the time spent as a CEV team member. 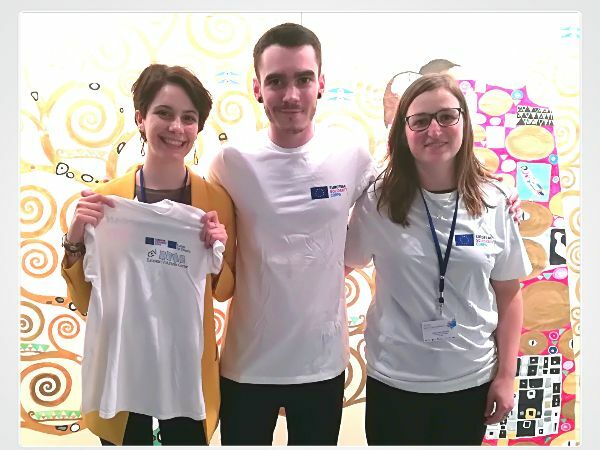 Helena Gandra, former ESC trainee at CEV continued the legacy of her traineeship and initiated a team volunteering engagement with Amnesty International Write for Rights action in her current employment at Allianz Brussels. Well done for offering a #HelpingHand and inspiring others to do so! Volunteering Hungary - Centre of Social Innovation held the third pro bono marathon of Mastercard Hungary in December 2018. A video from the event is available here. In 2018, CEV, in cooperation with the Moody’s Foundation and with the support of its network planned and implemented almost 30 Moody’s TeamUp actions for 12 European and Global Moody's Offices (Paris, Grenoble, Milan, Madrid, Limassol, Frankfurt, Madrid, Stockholm, Dublin, Moscow, Johannesburg and Dubai), offering in total 225 employees volunteering opportunities. Moody’s Team up showed the positive impact on the volunteer organizations, the beneficiaries of the actions and on the volunteers. All the stakeholders were deeply involved and guaranteed the success of each volunteering action. CEV is please to work again with the Moody’s Foundation in 2019 across Europe and beyond for the implementation of their TeamUp in the broader context of the CEV-EVEN Employee Volunteering European Network. Full 2018 report will be available soon. The NCVO Training Calendar for the first quarter of 2019 is available here and their annual report The Road Ahead 2019 that presents opportunities and challenges for volunteer organisations, was published. 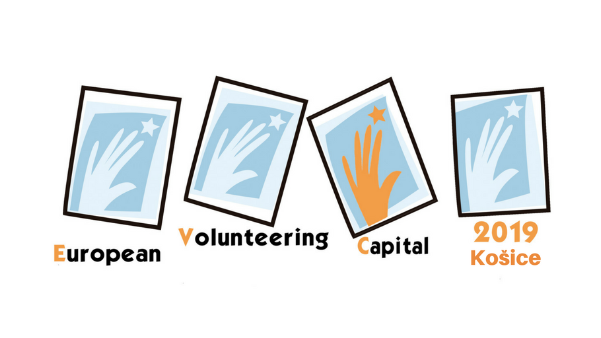 The Volunteer Centre in Denmark- Center for frivilligt socialt arbejde is organising the Volunteer Knowledge Day on 17-18 January 2019, comprising of a variety of input to strengthen volunteer-involving-organisations in areas such as management, collaboration, fundraising and documentation. 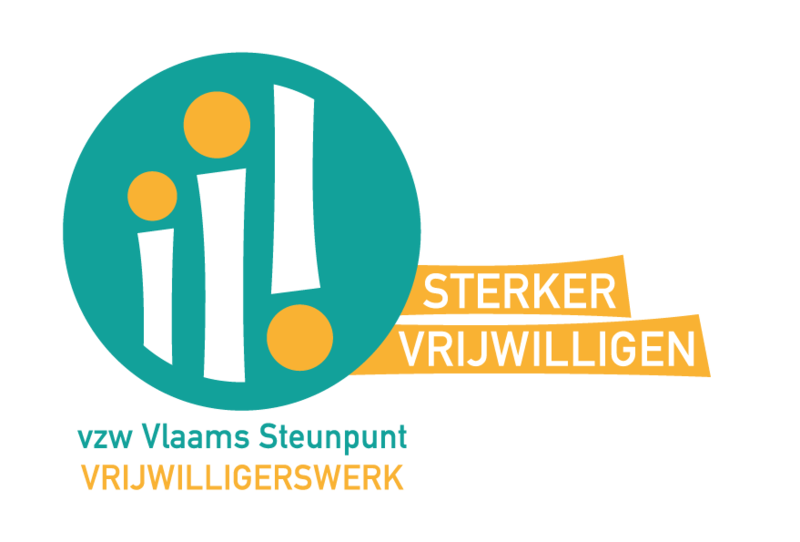 The Flemish Platform for Volunteering Vlaams Steunpunt Vrijwilligerswerk vzw is organising the Seminar “Competences and talents in volunteer work” on 28 February 2019 - open registrations. France Benevolat shared more details about seniors in formal volunteering in France here. The first-ever Romanian Presidency of Council of the European Union started on 1 January 2019 (#ro2019eu) Through its fourth pillar priorities it also focuses on “Europe of common values” and aims at stimulating the solidarity and cohesion of the EU through promoting policies on combating discrimination, ensuring equal chances and equal treatment between men and women, as well as through increasing the involvement of the citizens, in particular the youth, in the European debates. Read more here. 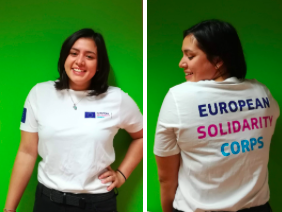 The European Solidarity Corps 2019 Call for project proposals launched with a budget of more than €96 million available to support solidarity activities for young people in 2019! Deadlines for submission of projects fall between 5 February and 1 October 2019 depending on the type of activity. Find more here. On June 6th and 7th 2019, CEV will organise in collaboration with Movimiento por la Paz, el Desarme y la Libertad (MPDL) the conference "EU Aid Volunteers: MPDL deployment of volunteers for peace building and women rights" in Brussels. It forms part of a EU funded project being implemented by a consortium of six organisations including Movement for Peace -MPDL- from Spain, and ADICE from France and five hosting organisations in Colombia, Guatemala, Nicaragua, Peru and Bolivia. The main goal is enhancing local communities and organisations’ capacities to cope with humanitarian crises and catastrophes with special emphasis on peace building and women’s rights through the deployment of 16 volunteers, while promoting volunteering in the EU and abroad. Find more here. On 16 January 2019 the EESC organised a public hearing in the context of preparing an opinion on European philanthropy looking at how philanthropy can contribute to EU values, such as cohesion, social justice and European Policies and its connection to the implementation of Article 11 of the Lisbon Treaty. More details here. On 19 December 2019 EU ambassadors agreed on the Council's position on the two programmes which constitute the EU Justice, rights and values fund as part of the future EU financial framework for 2021-2027. The Rights and Values programme, that incorporates actions and objectives currently covered by the Europe for Citizens programme, aims at protecting and promoting rights and values, including by supporting civil society organisations. It has three specific objectives: promoting equality and rights; promoting citizens engagement and participation in the democratic life of the Union; and fighting violence. Read more here. 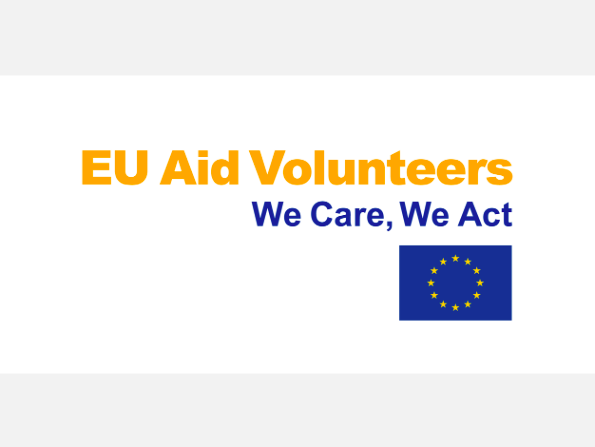 The January 2019 edition of the EU Aid Volunteers newsletter is available here. The newsletter has been produced to share EU Aid Volunteers news with the support of EU Aid Volunteers network. FOCSIV, along with other European organisations concerned about the future of the the EU AID Volunteers programme has elaborated a statement paper regarding the negative effects that the current regulation proposal for European Solidarity Corps 2021-2027 may bring on EU Aid Volunteers. Read and sign the position paper here. Showcase Your Impact as a Leader: Submit a Video for the 2019 Points of Light Conference! This year’s Points of Light Conference ( 18-20 June in St. Paul, MN. USA) will have a strong focus on volunteer engagement leadership, including an exciting plenary and over 40 breakout sessions. YOU are invited to contribute to the Volunteer Engagement Plenary, “Embracing Your Role as a Catalyst for Impact.” Click here for more details and instructions on how to submit your video by 15 February. 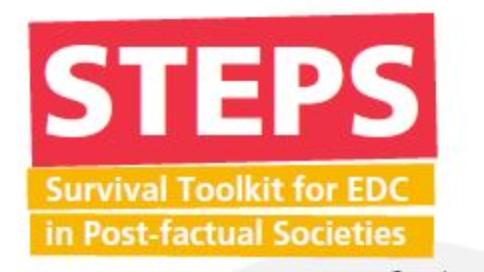 The new DARE BLUE LINES publication: STEPS - Survival Toolkit for EDC in Post-factual Societies was published. STEPS was developed and supported as E+ KA 1 mobility of youth workers. It brought together NFE-practitioners, youth workers, educators, youth researchers from all over Europe in a series of topical workshops and meetings, with the aim to develop a NGO and NFE perspective on the challenges of populism, post-factulism and radicalisation. Have you considered the prejudice surrounding the way nonprofits work, especially when it comes to funding and grant reporting? Find here an opinion advocating for more trust and flexibility is supporting the third sector.